Day 4: Sticks and Stones… | Families for HoPE, Inc. So the schoolyard rhyme says that names can never hurt me, but it’s wrong. Broken bones heal, emotional scars from poorly chosen words take a lifetime to fade and they never completely heal. Somehow as a society we have taken harmless words, loaded them with venom and assaulted each other with them. One of the many valuable lessons I learned caring for Arthur is to choose my words carefully and administer them with kindness. I’m not just talking about people who call kids who have intellectual delays names, I’m also talking about professionals in medical settings who are so wrapped up in using clinical jargon that they scare their patients. There are also the well meaning people who know they have to say “something” to grieving parents and end up blurting out something very hurtful. In a way, I feel that Arthur was lucky he led such a short life. One of the fears I had when I found out that he would be significantly behind intellectually is that he would be bullied by his peers. I was terrified for the fate of the first person I ever caught calling him the “R” word, and I absolutely did not want to ever have to explain to him what that name meant. Not only did I have to worry about other kids using this word to hurt his feelings, but I also had to worry about older people who were not up on the latest politically correct terminology. I don’t think I could bear hearing an elder referring to my son as “that little retarded boy” without even realizing how that phrase stings. My job as a mother is to protect my children at all costs, and I felt as if the only way to protect Arthur would be to buy him a set of ear plugs. Childhood bullies aren’t the only people who hurt feelings with words. 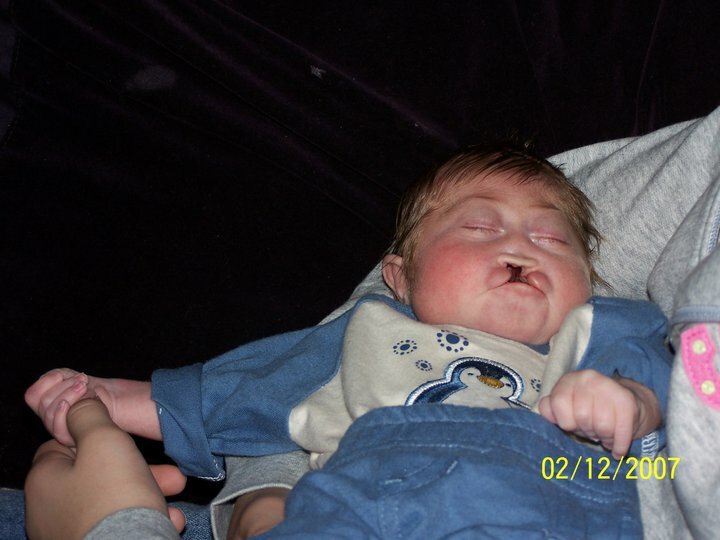 The most painful words I have ever heard anyone use to describe my son was the neonatal specialist who, upon viewing a prenatal ultrasound, described him as having “significant and severe facial malformations”. He also told us that he would have “very significant physical and mental delays”. These words were chilling to a mother who, until a few days earlier, thought she was having a perfectly healthy baby. The clinical babble that I heard actually made me afraid to look at or bond with my infant who I had waited for so long to meet. It would have been so much less painful had they told me simply that he would not look or behave like most other children. Finally, after we lost Arthur, things seemed very weird with a lot of the people we saw every day. Some handled the situation beautifully by a simple “I’m sorry”, or by just not saying anything at all. Others made an all too difficult time even worse. I was asked often if we were going to “try again”, as if we tried once and didn’t succeed, so surely we would be able to try again and replace him. I was also told that we should be grateful that at least we have other children. Well, we are very grateful for our other children, but that doesn’t mean we don’t have one missing. The absolute worst comment was someone comparing the loss of our son to him having to have his cat put down. Yes, I get that losing a pet is painful. I know people who love their pets so much that I’m sure it’s just as painful, but it’s absolutely a different kind of pain. Even people who have lost children don’t know the pain I experienced losing my own, Roy doesn’t even feel the same type of pain that I do, his pain is no more or less than mine, just different. Even though bereved parents seem to have lots of feelings in common, none of us know how the others feel. The ironic thing about Arthur teaching me about kind words is that I’m still under the impression that he had a hearing impairment. When the hospital tried to do the hearing test that was part of the newborn screen, the machine wouldn’t work. They actually made several attempts, but we never got a definitive answer. He had a startle reflex, but it seemed to happen at inappropriate times, and he certainly responded to touch over sound. Roy would sing to him and Arthur would snuggle in tighter as if he was rooting for the vibration. It is very possible that Arthur never heard a word anyone ever said to or about him, but it just makes me feel better to know that he was spoken to with the utmost kindness and respect.